Sigenics, Inc. is proud to be one of seven team institutions comprising the IntraCortical Visual Prosthesis (ICVP) project. The ICVP project, with Illinois Institute of Technology as the lead institution, has been awarded an $11.8M five-year grant from the National Institutes of Health (NIH), that includes a $1M subcontract to Sigenics. Funded under the BRAIN Initiative, the NIH grant is a culmination of research and development that spans over 15 years. The ICVP team includes researchers from seven institutions: Illinois Institute of Technology, University of Chicago, Johns Hopkins University, University of Texas - Dallas, the Chicago Lighthouse, MicroProbes for Life Science, and Sigenics, Inc.
Dr. Philip Troyk, Sigenics’s CEO and Professor of Biomedical Engineering at IIT, and the other members of the ICVP team, have been working on the ICVP project since 2000 towards the goal of helping visually-impaired persons re-gain the sense of sight. Sigenics is providing the implanted and external custom-designed electronics necessary for the testing of the ICVP system in a clinical trial. The ICVP may provide the user with meaningful artificial visual perception through the use of electrical stimulation of the visual cortex of the brain. After surgical implantation into the brain, a collection of 16-channel stimulator modules, called wireless-floating-microelectrode-arrays (WFMA) use Sigenics-designed wireless electronics that control stimulation through miniature needle-like electrodes; the electrodes are small enough so that about five electrode tips could be placed at the end of a human hair. The Sigenics team has also developed the non-implanted hardware that will process an image captured by a camera for communication to the brain. The system concept can be seen in the infographic below. ICVP Concept: The WFMA modules stimulate the brain with image information captured by a camera using wireless power and command transmission. 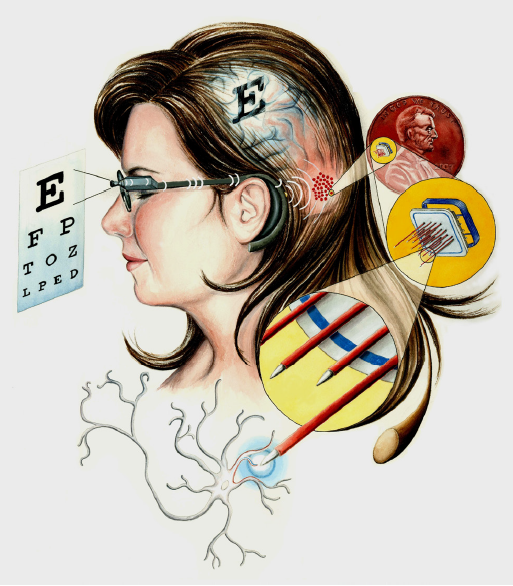 The origins of the ICVP project date back to the early 1970s during which the NIH began funding numerous fundamental studies towards the goal of implanting a multichannel cortical visual prosthesis system. While the NIH-directed visual prosthesis project ended in 2000, Troyk organized the new ICVP project to continue the work. Following years of funding and technological development, the team has now been awarded highly-competitive BRAIN Initiative funding to be used for the clinical trial that will test the ICVP system in five non-sighted volunteers. We are very excited to be a member of this ground-breaking project. Please stay tuned for future information in regard to this project’s development. To learn more about our expertise, please visit our services page of our website here. The ICVP project is supported by the National Institute Of Neurological Disorders And Stroke of the National Institutes of Health under Award Number UG3NS09555. The content here is solely the responsibility of the authors and does not necessarily represent the official views of the National Institutes of Health. For more information about the ICVP project please call: (312) 567-5304.